Velappity offers an online compliance logbook for your customers so key information is available to the end client at a glance. No more paper-forms left on site, no more folders of assets and test results, and no more phone calls chasing documentation. All these details will be managed using our client portal. Our client portal can be branded with your company logo and information. Velappity clients offer this as a service to their customers. Send clients reports and updates instantly, eliminating time wasted liaising and business cost of writing up official documentation. Viewing details about site activity couldn’t be easier. 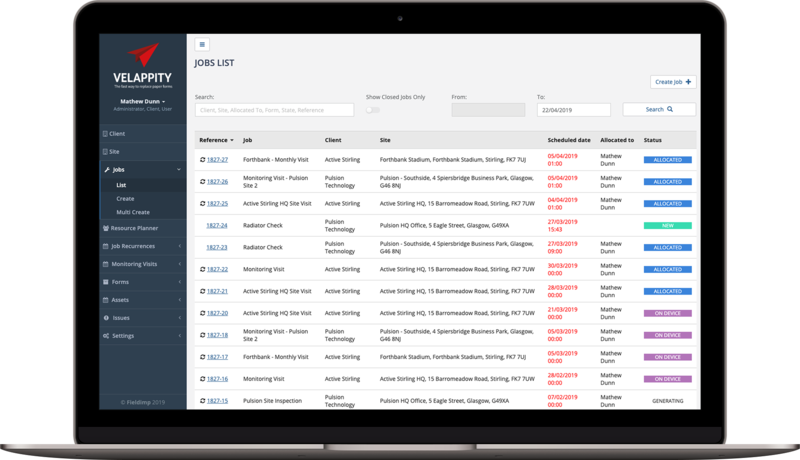 With a simple calendar view, you can see all site visits and reactive jobs instantly. Visits are categorised into how often they occur using colour codes. Reach valuable information in two-clicks and easily see required information. Mitigate organisational workload, allowing easy deligation of routine record keeping tasks to the actual customer. Issues can be managed from the Velappity web application, which automatically updates the client portal. Giving your customers control and ensures they follow compliance procedure.